BASSBOSS was asked to design and provide complete loudspeaker systems at two official SXSW stages, The Main I and The Main II . Time and again, BASSBOSS consistently delivers precision and quality that makes their products a standout feature. Everyone talks about how good it sounds when walking away from the show. the company was asked to design and provide complete loudspeaker systems at two official stages, The Main I and The Main II . “The fact that so many incredible artists descend upon Austin each year is always exciting,” says Lian Amber, CEO of BASSBOSS. “Having that kind of talent and intensity in one place creates electricity in the air, and BASSBOSS was proud to feed into that with our speaker installation at The Main I and II.” BASSBOSS was tasked with providing systems that could convert a now bare space, located at the former home of Emo’s, a popular local live music club that has since relocated, into two separate clubs capable of handling the sound needs of top flight talent including Bun B and Steve Aoki. BASSBOSS president David Lee designed systems that were up to the task by utilizing some of BASSBOSS’s newest products, including the LA88 Line Array and VS21 subwoofers. The VS21 Subwoofer’s modest weight, manageable size and amazing versatility make it an ideal subwoofer solution for portable use. Its convenient shape and compact footprint make it equally appealing for permanent installations. The VS21 Subwoofer offers output levels similar to a double-18” subwoofer but concentrates the delivery over a smaller area, providing more output per square foot. At 36” x 36” x 24”, the VS21 Subwoofer’s exterior dimensions are similar to many popular budget folded-horn subwoofers, so for venues with existing 3’x2’ cutouts and the need for a massive upgrade, the VS21 Subwoofer delivers massive bass without requiring costly construction. The LA88 small-format line arrays delivered plenty of coverage to supplement the deep low end of the VS21 Subwoofers at The Main I. The compact form factor (25.25” wide x 19.5” deep and 9.75” high) allowed two 4-cabinet rigs to fit perfectly in the space. With ultra-wide 120-degree coverage there were no dead spots in the packed house. With each one self-powered by a 3000W amplifier, the LA88 offers incredibly flat frequency response , tremendous detail and huge dynamic power, giving life to the diverse sounds of the festival. “They’re extraordinarily powerful for their size. They weren’t operating anywhere near their maximum capacity and were completely filling the space,” Lee says. For Amber and Lee, The Main I and II was just the tip of the iceberg for BASSBOSS’s new VS21 Subwoofers and LA88 Line Arrays. “We’ve barely scratched the surface of what we can do with these products,” Lee says. “The VS21 is a subwoofer that has broad appeal. It’s not just for EDM, it’s fantastic for reggae, rock n’ roll, country, you name it. And the LA88 has the power, throw, and coverage to be utilized for much larger spaces and audiences. We’re very pleased with these designs. They offer outstanding performance relative to their size and cost.” As BASSBOSS continues to be called on for the hottest clubs in Austin—“Austin’s about to get its 25th BASSBOSS installation,” Amber says—they know that SXSW festival-goers will take the visceral experience of BASSBOSS speakers delivering the sounds of DJ Jazzy Jeff, Steve Aoki, and Lil Uzi Vert home with them. 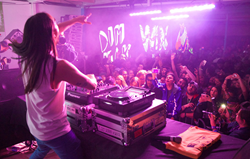 “We were thrilled to see Steve Aoki tweeting about how happy he was with the show, which was the 20th Anniversary Party for Steve’s record label, Dim Mak. It was even better to see all of those ecstatic faces in the audience,” Amber concludes.